Whether you are dealing with a professional automotive workshop or a household woodworking workshop for DYI projects, this worktable with double ledges and a bottom shelf maximizes space while providing a robust work surface and extra storage space for having all tools within reach. Like all other Metal Point system elements its boltless assembly, quality and design provide maximum strength and comfort to work safely and efficiently. This product makes it possible to have materials and implements in order and close at hand. With the option to adjust the height of the shelves, its functionality increases. Highly durable particle board surfaces: handle up to 1,000 lbs per unit. Ledges are manufactured in different widths, to suit the bench sizes and make the most of the storage area. A compact and functional design that integrates into all types of settings. Shelving Direct offers one of the largest selection of sizes of Heavy-Duty Workstations on the market. 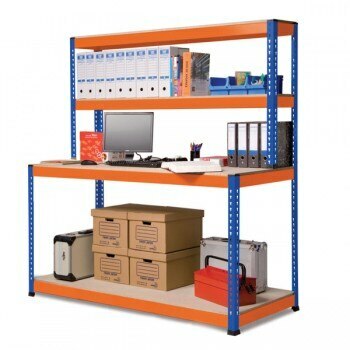 The Metal Point Plus workstation includes 6 vertical posts with plastic feet, 2 shelves, and 2 top shelves. Deep to shelves: 12", 18".